Every fight has a winner and a loser, and unless you spend some serious time training, there's a good chance you'll be the loser at least once. Hopefully, it will never happen, but if it does, these techniques will help you roll with the punches and walk away with only a few scrapes and bruises. Illustration by Angelica Alzona. In any fight, especially a losing one, you're going to take more than few hits. The first thing you need to learn, says Cade Courtley, the author of SEAL Survival Guide: A Navy SEAL's Secrets to Surviving Any Disaster, is how to protect your face. You have vulnerable points all over your body, but most of them are collarbone up. Start by keeping your hands up in front of your face so you can block some of their blows with your hands and forearms. Also, keep your chin tucked down towards your chest. This prevents whiplash, and keeps your eyes on your opponent so you can see when they're going to hit. Claressa Shields, Olympic boxing gold medallist, suggests you keep your focus on their chest, not their eyes, so you can see the early muscle movements that indicate an attack. That way, even if a punch makes it past your defences, you still know it's coming and where it's headed. When a punch makes it through, move your head and upper body in the same direction your opponent is punching. Academic Earth explains the physics in the video above, but bottom line, you want to move with the punch, extending the period of time the transfer of momentum occurs. Shane Fazen at the fightTIPS YouTube channel describes getting hit in the face like a vehicle head-on collision. When you roll with the punches, the punch becomes more like a collision where both drivers turn at the last second and merely glance off each other. If you don't have as much time to react, or you're too close to your opponent, John Graden from the Martial Arts Teaching Association recommends you lower your head and let your forehead absorb the blow. For punches to the body, Shields suggests you keep your elbows in close to your sides. This acts like body armour to absorb some of the impact, and if you keep shifting your body as they strike, your opponent's fists will graze off your elbows and biceps. Fazen notes, however, that blocking your body doesn't mean dropping the guard to your face. Crunch to the side and protect your ribs while keeping your hands up. When you get a blow to the stomach, tense your abs and exhale as the hit lands. If your opponent is just looking to show how badarse they are or "teach you a lesson", they might be satisfied with a couple of punches — especially if you can sell the fact that you're in pain and they have already won. If they don't stop, you need to find a way to escape, or try and drop them yourself. Getting knocked off your feet will do some major damage, especially if you land on your head. 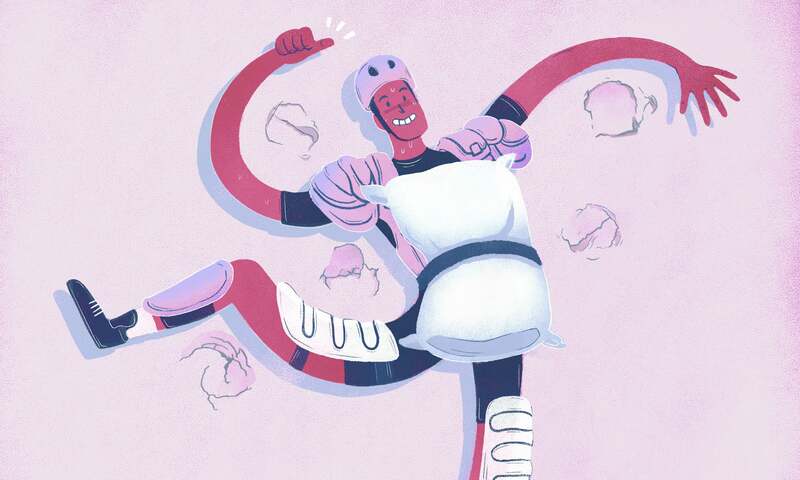 You're also more vulnerable to pummelling on the ground, so it's imperative that you stay on your feet. We spoke with Gary Wolfe, professional boxer turned boxing trainer, and he recommended you always keep a lead foot forward for balance, agility and power. If your feet are squared up to your opponent, it's harder for you to dodge attacks and absorb the blunt force of strikes, and you're much easier to knock down. This setup with the lead foot is what's commonly known as the fighter's stance. As Jack Slack, a combat sports analyst, explains in the video above from the Fightland YouTube channel, almost every martial art in the world employs a similar stance (with some variation), and for good reason. It's essential for multi-directional movement and for generating power when you try to strike back. A fighter's stance lets you move your head side to side, front to back, and it allows you to use your leg to block low kicks that might otherwise topple you to the ground. If your opponent charges in an attempt to tackle you, you can throw your weight into your stance and use a basic technique called an "arm stop" to hold your ground. In this video from the Funker Tactical YouTube channel, Krav Maga trainer Ryan Hoover demonstrates. This can keep you upright and create some space between you and your opponent. After an arm stop, you can push them away, try to escape or use it as an opportunity to strike them. They might still get some hits in on you, but it's worth it if it means staying off the ground and possibly making an escape. If you do end up on the ground, protect your face and body the same way you would if you were upright, and use your legs to kick like mad and push your opponent away so you can get back up and get the hell out of there. Like your face, it's vital you also protect your neck, even if it means taking a few hits. If they come at you from the front and manage to get their hands on your neck, Fred Mastro, who teaches the Silat Defence System, recommends two moves to break free. The first technique, shown in the video above, is simple: As soon as they grab onto your throat, quickly twist your body and use your shoulder to push their arms aside. The combination of the twisting motion and force from your shoulder will break their grip. The second technique, demonstrated in this video here, is for when your back is against a wall. With both arms up protecting your face, cross an arm over one of your opponent's arms and grab your other wrist, then violently pull down on their elbow inward. They will have to release their grip or risk breaking their elbow. If the chokehold comes from behind, Shane Fazen has three suggestions for you in the video above: eye gouging, biting and finger bending. The eyes and fingers are some of the most effective places on the body to do easy damage, and might cause them enough pain that you can slip away. Remember, you're getting your arse kicked and trying to get out in one piece here, not trying to win a medal. Do whatever it takes to get out of the chokehold and create distance between you and your opponent. 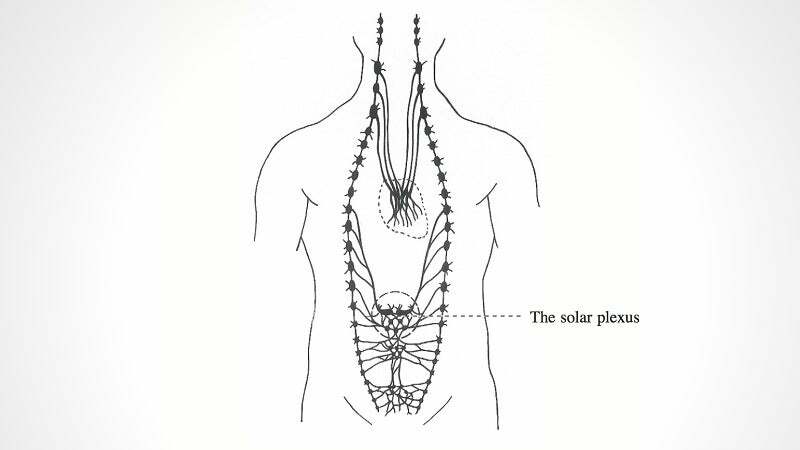 A straight shot to their solar plexus: The solar plexus, or celiac plexus (pictured above), is a network of nerves located in the upper abdomen, right above the stomach. If you get a good hit on someone there, they will have "the wind knocked out of them" and need a few moments to recover. Go for the groin: The groin is super vulnerable and a strong hit in the area will require some recovery time. There are a lot of different ways to attack this region of the body, so go nuts. Until you find an opening to escape, distance is key. As Jack Slack explains in this video, the push kick, where you push your opponent away, will help you maintain distance while you circle around. In fact, Travis Roesler at the FightSmart YouTube channel, recommends using kicks to fend off opponents who are overly aggressive or much larger than you. This lets you maintain distance while they tire themselves out and gives you time to find an escape route. Remember, just because you're going to lose a fight, doesn't mean you have to stick around to see the end of it.